It is a great pleasure for me to be here with you all today in Astana, Kazakhstan's singularly stunning capital. Not yet two decades old, Astana is a brilliantly planned Eurasian centre - a grand, global city in the making. And fast. In less than nine months, Expo 2017 - Central Asia's first world's fair - opens here, with its "Energy of the Future" theme and its green technology focus. And, as the fair winds down, the newly established Astana International Financial Centre, set smartly within the fair's vast grounds, will help power Kazakhstan in its resolute rise as Central Asia's financial hub. More than enviable ambition, Kazakhstan, the world's ninth largest country, is blessed with an abundance of natural resources. In just 25 years of nationhood, the country has staked its place as a regional economic dynamo and global trading partner. Kazakhstan's international standing was in the spotlight in late June, when the country was elected to the Security Council of the United Nations as a non-permanent member, with its two-year tenure beginning in January next year. And, last November, Kazakhstan became a member of the World Trade Organization, the WTO. Congratulations are in order, and I am pleased to offer them in person today. 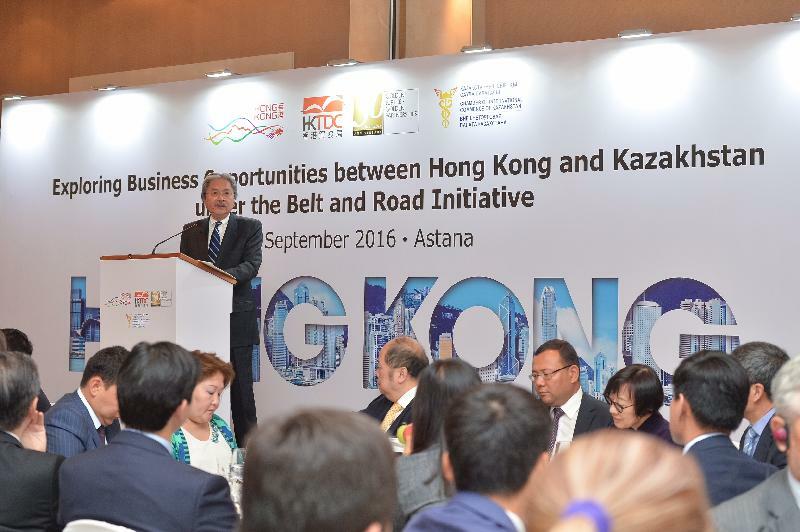 Hong Kong's economic ties with Kazakhstan are encouraging, with bilateral trade rising by some 19 per cent a year, on average, between 2011 and 2015. That is why the Hong Kong Trade Development Council, our trade promotion agency, has led four business missions to Kazakhstan in the past three years. It is also why I am here today, bringing with me a high-profile mission from Hong Kong. Joining me at this mission are some 30 senior Hong Kong business people. They come from a variety of sectors, including finance, logistics, infrastructure and real estate, telecommunications and technology, and legal services, and more. We are all keen to learn more about Astana, the transport, communications and logistics centre at the heart of the Eurasian continent. Keen, as well, to expand business and trade relations with Kazakhstan, Central Asia's largest economy. In that, we share a common interest; indeed, a promising future. That's thanks to the Silk Road Economic Belt and the 21st Century Maritime Silk Road initiative spearheaded by our President Xi. The two corridors of the Belt and Road Initiative encompass some 65 countries across three continents, accounting for some 30 per cent of global GDP and some 30 per cent of the world's merchandise trade. It has been designed to promote, among others, infrastructural connectivity and, in doing so, boost trade and investment, deepen policy co-ordination and create stronger people-to-people bonds among participating countries. In short, the Belt and Road Initiative is destined to become the driving force of the global economy in this 21st century. It will generate demand and it will expand international trade and investment flow, as well as two-way traffic in Central Asia, Southeast Asia, Middle East, Africa and Europe. Kazakhstan is a key player in the Belt and Road Initiative. It is the critical gateway between the East and the West. That's not at all surprising, given that Kazakhstan, and Central Asia in general, served for centuries as the original Silk Road's East-West bridge. Today, with its vast land area and strategic location, Kazakhstan has what it takes to be the most prominent business and logistics hub of the Belt and Road corridors. Hong Kong, too, sees unprecedented promises in the Belt and Road Initiative. Working together, I believe there is much our two economies can accomplish. In the next few minutes, allow me to share with you some of my thoughts on that. Hong Kong's unique advantage is our "one country, two systems" arrangement with the Mainland. Under this framework, Hong Kong maintains our own social and economic systems, while still being an inseparable part of China. Hong Kong is one of the best places in the world to do business. We are a global city, and we fly the flag of free trade. For the past 22 years in a row, the Washington-based Heritage Foundation has named Hong Kong the freest economy in the world. That means an open and level playing field for all businesses, wherever they come from, whatever they do. Legally, of course. And according to the IMD World Competiveness Yearbook 2016, Hong Kong was ranked the most competitive economy in the world. Apart from our favourable business environment, the many advantages of Hong Kong also include the rule of law, and our intellectual property rights protection reassures international business. Hong Kong is one of the most internationalised cities in the world, with English as one of our official and commonly used languages. Our society is free and open, and our lifestyle a sophisticated melding of East and West. Hong Kong maintains our own currency, which is fully convertible. Capital from the Mainland, and from all over the world, flows freely in and out of Hong Kong. Indeed, Hong Kong is among the world's leading financial capitals. We have the experience, the expertise and the connections to serve as the fundraising and financial management hub for the Belt and Road economies. Our financing options range from public offerings and loan syndication to private equity as well as Islamic finance. Our stock market is the eighth largest in the world in terms of market capitalisation, and Hong Kong ranks first, globally, in equity funds raised through initial public offerings. Equally important, Hong Kong is China's international financial capital. We are the first mover in the Mainland's continuing economic reforms. Mutual access between the Mainland and Hong Kong has soared since the opening of the Shanghai-Hong Kong Stock Connect in late 2014, and the introduction of the Mainland-Hong Kong Mutual Recognition of Funds Arrangement last year. And with the commencement of the Shenzhen-Hong Kong Stock Connect by the end of this year, Hong Kong's role in the two-way opening-up of the Mainland's capital markets to the rest of the world will continue to grow. Thanks to our deepening economic integration with the Mainland, Hong Kong is the world's largest offshore Renminbi business centre. We provide international investors with a wide variety of Renminbi products, including those for cross-border trade settlement and Renminbi financing. As trade and other economic activities along the Belt and Road region expand, so, too, will the demand for Renminbi services. Hong Kong can respond fully and quickly to that demand. After all, we have been handling the lion's share of Renminbi trade settlement since its beginnings in 2009. Our Renminbi debt market has also been steadily developing. And Hong Kong has the largest "dim sum" bond market in the world, with outstanding "dim sum" bonds amounting to more than RMB300 billion. Our "dim sum" bond market is supported by a liquidity pool of some RMB800 billion - again, the world's largest pool. Given the substantial Muslim population living along the Belt and Road corridors, we expect Islamic financial services to be equally promising. Over the past two years, the Hong Kong Government has successfully issued two global sukuk, or Islamic bonds. These two issuances drew strong interest from the global financial industry, showcasing our financial expertise and economic fundamentals. Equally important, they underlined the confidence international investors have in Hong Kong. We are now working on the third sukuk issuance. Asset- and risk-management services will also be in demand once the Belt and Road Initiative finds traction. And I am pleased to note that Hong Kong's wealth- and asset-management business has maintained its strength, despite a tumultuous year for global markets. Our combined fund-management business amounts to more than US$2 trillion in assets, with close to 70 per cent of the funds sourced from overseas investors. That's why I am confident when I say that Hong Kong can serve as a global centre for asset management, risk management and corporate treasury functions. Hong Kong boasts a wide variety of insurance services and derivative products as well. They offer good reasons for Kazakh companies to manage their risks by setting up captive insurers in Hong Kong. In July this year, the Hong Kong Monetary Authority set up the Infrastructure Financing Facilitation Office (IFFO). To date, more than 40 organisations have joined IFFO as partners. They include multilateral financial agencies and development banks, public-sector investors, private-sector investors and asset managers, commercial and investment banks, infrastructure-project developers and operators, and professional service firms. IFFO provides a unique channel to promote Kazakhstan's infrastructure development. It can help your projects attract foreign investment and financing. It can also assist your government agencies in offering their services and expertise related to public-private partnership projects. And this can only support your Government's drive to transform Kazakhstan into a knowledge-based, diversified economy. Indeed, Kazakhstan's industrial diversification and upgrading from a raw material supplier to a more service-based economy offers Hong Kong companies opportunities across a range of sectors, from logistics to trading and professional services. After all, 93 per cent of Hong Kong's GDP concerns services. Our multicultural, multi-talented pool of services professionals - in finance, accounting, law, architecture, engineering management and more - is another Hong Kong advantage. They have the international experience to lead consultancies, construction projects and the operations and management of infrastructure projects along the Belt and Road corridors. And they look forward to working with Kazakhstan companies. Then there are our legal professionals, who work with a world of business every day. A few notable members are present here today. They conduct due diligence, ensure contract enforcement and help resolve disputes. And they do so under a system supported by the twin foundations of the rule of law and an independent judiciary. I would say that makes Hong Kong an ideal centre for resolving potential commercial disputes arising from business collaboration. Logistics is no less central to Hong Kong's strengths as an international business centre. Hong Kong has one of the world's busiest container ports and the busiest cargo airport in the world since 2010. Last year, our airport handled some 4.4 million tonnes of cargo, running about 1,100 flights a day. Let me add that Hong Kong can reach nearly all major Asian economies within four hours' flight time. Half the world's population is just five hours away from Hong Kong. And we are expanding the airport into a three-runway system. Construction is now under way, with completion expected in 2024. The addition is expected to boost our airport's handling capacity to some 100 million passengers and 9 million tonnes of cargo a year by 2030. I am encouraged by the increasing presence of Kazakh business in Hong Kong. Kazakhmys Plc, Kazakhstan's largest copper miner and manufacturer of copper products, relocated its marketing and logistics department to Hong Kong from London a few years ago. And KTZ Express, a subsidiary of Kazakhstan Railways, opened a Hong Kong office in 2014. It provides freight transport for companies trading with Central Asia. A number of Kazakh SMEs have also chosen Hong Kong as their regional base, taking advantage of our location and our financial and professional services to do business with the wider Asian market. And I am confident that more Kazakh investors will make use of the world-class infrastructure and services of Hong Kong to venture into the vast markets of the Mainland and the Belt and Road economies. I am pleased to note that the Astana International Financial Centre and the Hong Kong Trade Development Council will sign a Memorandum of Understanding this afternoon to further enhance trade and investment promotional efforts between Kazakhstan and Hong Kong. There is clear synergy and advantages for our two economies to further expand our business collaboration and to fast-track our growing ties, through the signing of agreements, such as free trade agreement, Investment Promotion and Protection Agreement and Comprehensive Avoidance of Double Taxation Agreement. In each of these areas, we look forward to moving ahead with Kazakhstan as soon as possible. My thanks to the Hong Kong Trade Development Council for organising today's luncheon, for bringing together high-profile business leaders from Hong Kong and Kazakhstan. I am confident that this is the beginning of a rewarding relationship between our two economies. Our two peoples. I wish you all the best of business, and the city of Astana a successful Expo 2017. And I look forward to welcoming our Kazakh friends to Hong Kong.